(Tech Xplore)—Scholars have recognized that Medieval Islamic tiling reveals more than beauty; it also reveals mathematical prowess. A report in New Scientist in 2007 discussed how Medieval Islamic designers used elaborate geometrical tiling patterns at least 500 years before Western mathematicians developed the concept. A set of five girih tiles decorated with lines that fit together to make regular patterns first appeared about 1200 AD, a time when Islamic mathematics was flowering. The designs grew increasingly complex. Later on, near-perfect Penrose patterns were found on the Darb-i Imam shrine in Isfahan, Iran. The place of Islamic art in science was again made evident this week. Shannon Hall writing in New Scientist on Wednesday reported on a new class of futuristic materials that grow when stretched, supported by the geometries of ancient Islamic art. Ahmad Rafsanjani and Damiano Pasini from the mechanical engineering department at McGill University in Montreal have set out to create a material that can grow when stretched but keep its form. 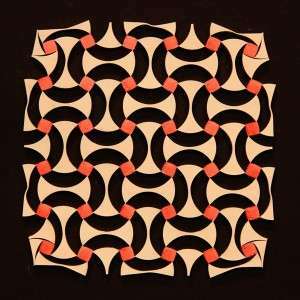 The researchers turned to geometric patterns in Islamic art in creating the mechanical metamaterials. They said that the compliant mechanical metamaterials simultaneously exhibit negative Poisson's ratio and structural bistability. "There is a huge library of geometries when you look at Islamic architectures," said Rafsanjani in New Scientist. The team picked their design from the walls of two mausoleums built in 1067 and 1093 in the plains in northern Iran. The walls carry decorations with about 70 different designs, they chose the geometry they wanted. The metamaterial was fashioned from natural rubber—fabricated by perforating a symmetric cut pattern into a rubber sheet. "Its building blocks are rotating units with square or triangular shapes connected together with compliant flexure hinges," they wrote. "Under the action of uniaxial extension, the relative rotation between the adjacent members triggers snap-through instability and brings together auxeticity and structural bistability. As a result, this metamaterial can accomplish reversible reconfiguration between two stable arrangements." Rafsanjani presented their work under the title "Multistable Compliant Auxetic Metamaterials Inspired by Geometric Patterns in Islamic Arts" recently at a meeting of the American Physical Society in Baltimore. What do they mean buy auxetic materials? Elsewhere, Prof. Andrew Alderson at Sheffield Hallam University, talking to AZoM.com, said, "an auxetic material becomes thicker in one or more width-wise directions when it is stretched along its length. Conversely, it becomes thinner when compressed lengthwise. This contrasts with 'normal' materials which tend to thin when stretched – think of stretching an elastic band, for example – or thicken when compressed. The defining property of an auxetic material is, then, that it possesses one or more negative Poisson's ratios (as opposed to the positive Poisson's ratio displayed by 'normal' materials)."